NOTE: This article applies only to our Linux Shared accounts! You are approaching the post variable limit imposed by your server configuration. Exceeding this limit may automatically delete menu items when you save. Please increase your suhosin_post_maxvars directive in php.ini. More information You are approaching the post variable limit imposed by your server configuration. Exceeding this limit may automatically delete menu items when you save. Please increase your suhosin_request_maxvars directive in php.ini. More information You are approaching the post variable limit imposed by your server configuration. Exceeding this limit may automatically delete menu items when you save. Please increase your max_input_vars directive in php.ini. More information max_input_vars 1000 suhosin.post.max_vars 1000 suhosin.request.max_vars 1138. 1. Login to your cPanel account, and scroll down to Software section, click on the Select PHP version icon. 2. Once inside the tool, the first screen displays the current PHP version, which by default is listed as native (which is usually the most current/most popular PHP version). In order for you to be able to select different PHP configuration options and PHP extensions, you need to select PHP version different than the default native version. 3. 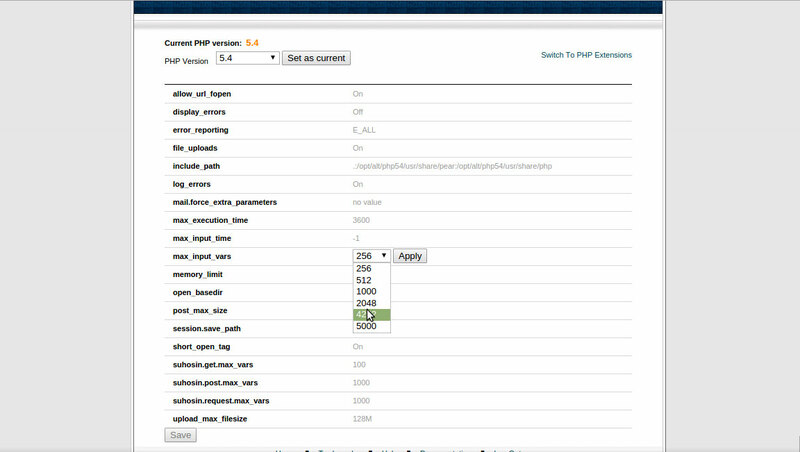 Once the desired PHP version is selected you will have to click on the Switch To PHP Settings as shown on the screen below. 4. Edit the value for suhosin_post_max_vars and/or your max_input_vars to the desired number from the drop-down menu and click Apply. 5. 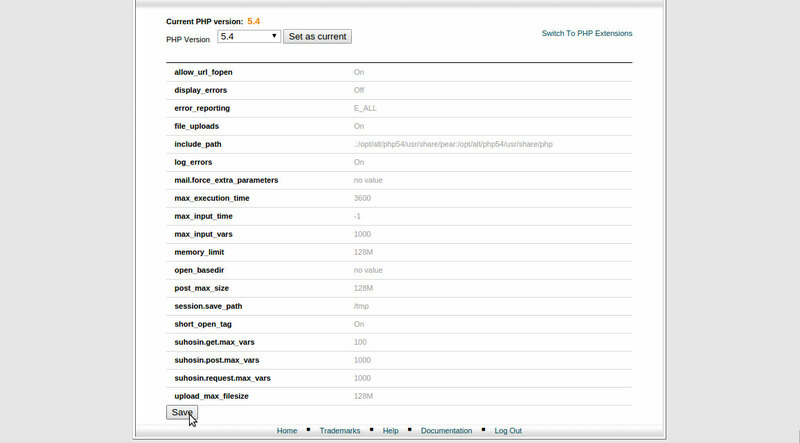 Once you are done selecting your PHP configuration options, simply click on the button Save at the bottom of the screen.